Excel Recovery is a new generation recovery tool, which has been designed to match your needs under any circumstances. It restores deleted XLS or XLSX files with unprecedented accuracy and efficiency even if your file system is damaged and your hard drive is almost dead. Unlike other recovery software on the market, it uses a new approach and revolutionary algorithms, providing a customer with maximum flexibility. If you have just deleted a MS Excel spreadsheet, you had spent many hours on, by a mere accident, Excel Recovery will restore it without any efforts within a couple of seconds. An advanced method of file system analysis will detect XLS files marked as "deleted" and remove this mark, resulting in a full resurrection. But what to do in a more complicated situation, when your file system can't be scanned, because it is badly damaged and your hard disk is inaccessible in Windows. That is the moment when most of the recovery utilities start being helpless. But not Excel Recovery! It will address your hard drive directly. Using a list of signatures associated with MS Excel format, in scans disk surface, detecting the beginnings and endings of every XLS file, resurrecting file contents and other necessary data. Comparing the results of the file system analysis and direct hard disk surface scan, Excel recovery make up a full list of target files, subjected to restoration. A full preview function provides you with a possibility to see a file name and its contents before a recovery procedure is executed. Thus you restore exactly what you need, avoiding unpleasant surprises. 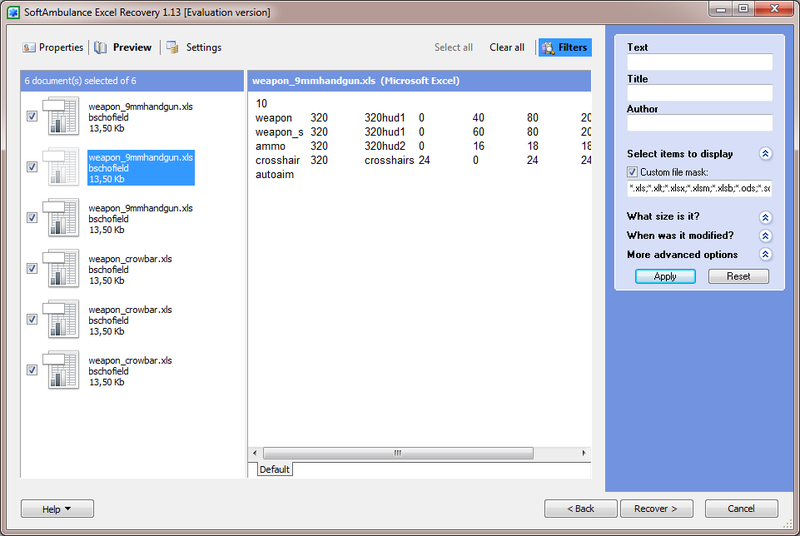 Multiple search filters will save your time and energy, minimizing the pre-recovery file list to a desirable size. Everything you have to do is to specify file name, date, size, author or text, containing in the document. Excel Recovery will become an indispensable tool in your home or office, restoring XLS spreadsheets even in the most dramatic situations, supporting all MS Excel versions. Any PC with Win2000 or newer. 15 Mb for install and enough disk space to save recovered data. Leawo iOS data recovery software is the best data recovery tool for lost data on any iOS devices, like iPhone, iPad and iPod touch. With it, you can retrieve up to 12 types of data, such as taken photos and videos, messages, contacts, notes, etc. If you are aggressing to restore windows backup file then use of higher technology windows backup recovery software. The software includes some exceptional features for MS BKF file recovery. When Windows BKF file shown error message as “The Backup file is unusable”, in such type problem you need BKF File Recovery Software recover, repair, read and extract corrupt BKF file that can resolve whole corruption problem. Make use of zip file repair software to resolve corruption of zip file and fix corrupt zipped archive database in efficient manner. Through this program everyone can access corrupt Zip file within less time period without losing anything. Active File Recovery is a powerful data recovery tool allowing you to recover files from formatted disks or those which have already been emptied from the Recycle Bin. Version 12 comes with various improvements and faster scanning speeds. Restore Exchange Public folder Utility for recovering exchange backup files which get corrupted due to bothering issues. Restore Exchange Public folder Utility is easy processing utility. When important files are lost or deleted from your iPhone, iPad or iPod touch, you can always makes good use of iSkysoft Free iPhone Data Recovery program to restore them for free. It's a powerful program that recovers SMS, photos and more data. Effective recovery of deleted, damaged, and inaccessible logical disks, accurate restoration of disk file structure, recovery of flash drives after formatting. RS FAT Recovery recovers files from any storage medium. If you don't know that how to fix corrupt backup file? Then try our BKF recovery tool which can fix your corrupt backup file easily. It is easy for everyone to fix BKF files after corruption and restore them on system. With SALVAGEDATA's free data recovery software for Windows, you can recover lost or deleted data from your hard disk or external drive. The Hard Drive recovery software is highly efficient and designed.